The Seattle Seahawks entered the 2017 preseason with, at best, a shaky offensive line. We have highlighted this on a number of occasions, pointing out that the offensive line is the team’s Achilles heel. 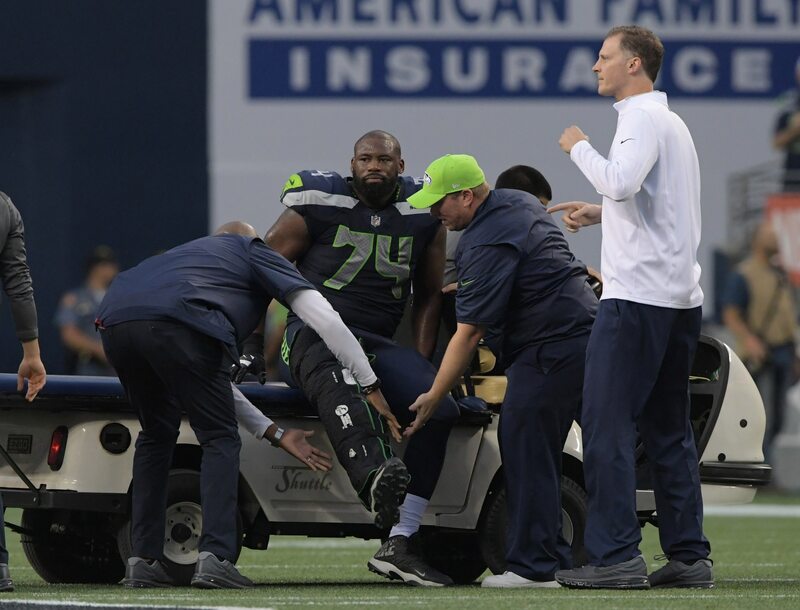 Now starting left tackle George Fant is on the shelf for the entire 2017 season after tearing his ACL on Friday night in an exhibition game against the Minnesota Vikings. Suddenly, that shaky line is as effective as a wet paper bag. Consider this: Starting right tackle, Germain Ifedi, was beaten like a drum a number of times Friday night. Here’s one example of his inability to present even the pretense of a barrier going up against Daniel Hunter, who swallowed Russell Wilson whole without breaking stride. Seattle cannot put Ifedi out there on the left side where he’ll be tasked with protecting Wilson’s blind side. The quarterback wouldn’t last half a season. The Seahawks know this. This is why Pete Carroll uttered the words Luke Joeckel and left tackle in the same sentence Friday night after announcing Fant’s season-ending injury. But anyone who’s watched the Jacksonville Jaguars in recent years knows that Joeckel is awful. He was brought into Seattle to play guard for a reason. He stinks on the edge, which is why he’s a legitimate first-round bust. It’s important to note that Wilson isn’t the only Seahawks player who stands to lose given the team’s current state of affairs. No matter who’s running the ball — be it Eddie Lacy, Thomas Rawls or Mike Davis — they won’t find many running lanes in 2017. Not running behind the current rag-tag ensemble the Seahawks have on their offensive line. The only way to salvage this dire situation is to somehow orchestrate a trade. Seattle must find a way to solidify its offensive line. There are no good options right now as the roster is currently structured. And the free agency cupboard has already been picked clean at the pivotal left tackle position unless you count recently discarded Branden Albert as a viable option. So which teams might be amenable to a trade? We can think of a couple options that might work. First, Seattle should look down the road to its NFC West neighbor, the San Francisco 49ers. Joe Staley is still one of the best left tackles in the business at the age of 32, and San Francisco is still very much a rebuilding franchise. He’s a player that the 49ers have reportedly been open to trading recently. It’s not often that we see divisional foes making deals of this nature, but it’s worth looking into, nevertheless. If that’s not an option, then Seahawks general manger John Schneider needs to get on the horn with Sashi Brown of the Cleveland Browns to discuss what it would take to get Joe Thomas to the west coast. Like Staley, Thomas’ name has been mentioned in recent years when discussing players who could be on the move. Seattle would have to give up some serious draft capital to make either deal work. But this is a team that is watching its championship window slam shut, at least for this season. You just cannot win in the NFL on a consistent basis with a crap offensive line. Somehow, the Seahawks need to find an anchor to keep this ship from getting destroyed on the rocks. And if that means forking over a first-round pick to a rebuilding franchise, then so be it.